You can eat a pawpaw in lots of ways. If they are ripe as you pick them, you can just break it open and smoosh as much as you can into your mouth. A sharp spoon works well. 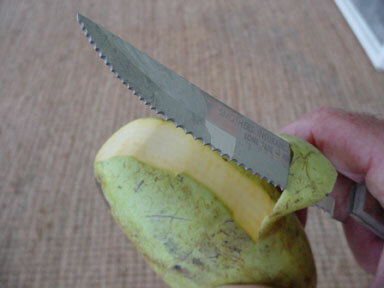 My favorite way is to peel the fruit with a knife or potato peeler. 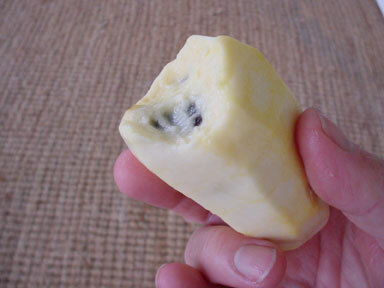 It seems the skin has some bitterness and off-flavors and it is best to get rid of it. The inside is just pure goodness. The bigger the bite, the better the flavor. With a big bite the custard like fruit just spreads out and finds taste buds you didn’t even know you had. There are about a dozen pretty big seeds. It is sorta like eating watermelon; you just spit the seeds out. 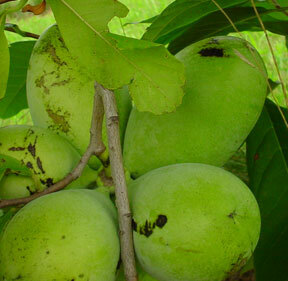 A big fancy pawpaw will have lots of fleshy fruit and a low percentage of seeds. The smallest wild ones can be almost all seeds sometimes. Good luck in the pawpaw patch! Ideally you pick a pawpaw when it is almost completely ripe. You can feel a little softness. 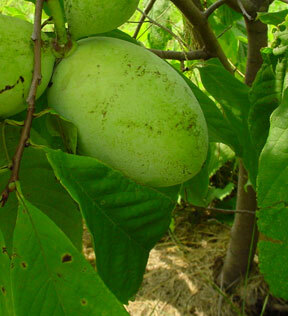 When ripe, pawpaws have a fairly strong “ripe fruit” smell. The best place to keep them as they ripen is a screened porch . You will have to learn to judge ripeness. It is sorta like with peaches – they are fine at all stages, but people will have favorites. I prefer very ripe with maximum flavor. These fancy pawpaws have been selected by Neal Peterson and others for the best taste (and bigger size, less seeds, etc.). The wild ones are fine, though. Occasionally you’ll get a little bitterness but nothing that is really bad (or bad for you). 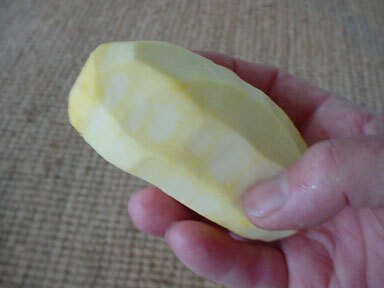 Once peeled I rinse the fruit. If I am serving others, I will put it on a saucer and give them a knife and fork. If it is for me, I just chomp right into it, usually over the sink. Burntridge has the cheapest trees. Their “unnamed seedlings from parents of improved cultivars” at only $6 are a good bet for the parsimonious amongst us. Here is my first “wild” picture, and it is hard to see what’s what. 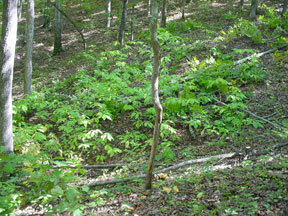 This is a small patch at the top of “peeper holler”. The small tree in the center, with the sun shinning on it, is a pawpaw. 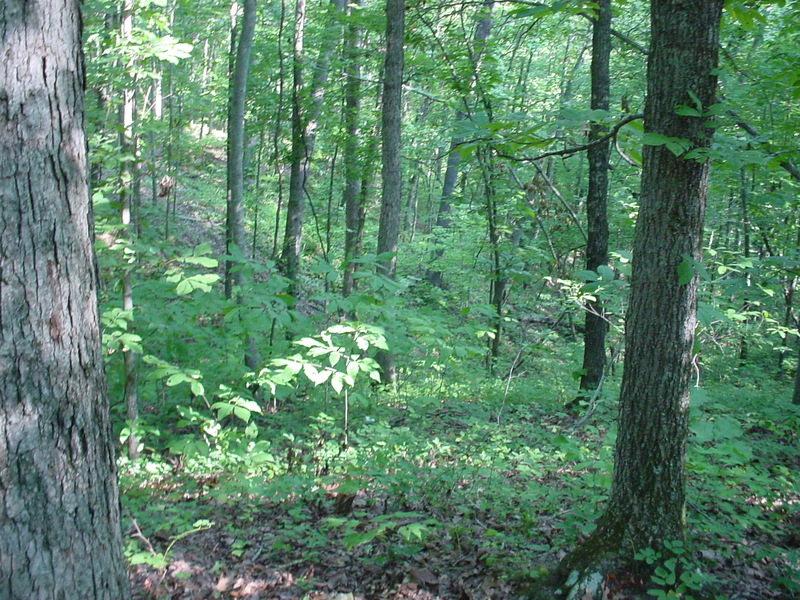 There is a circle of smallish trees like it, and no other pawpaws close by. My expert friend Patrick says this is probably a “clonal” patch, meaning there was originally one tree, which died, and these are the root suckers from it. He says if I graft or plant a different pawpaw nearby, which can then pollinate these, I may get fruit on them. 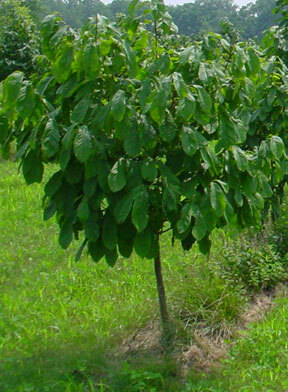 Anyway, what you potential pickers can get from this picture is what a typical under story wild pawpaw looks like. Ideally you can find some bigger trees in a sunnier location. I was hoping to find some wild patches full of fruit to take pictures of in October 06. No luck. Here is a different angle on the same small patch above. I cleared a few hickory trees out of it.